The above image shows the complete transmission mounting bracket for the 68-> MGB all synchromesh transmission with, or without overdrive. In this image, I have laid out the components in a manner that makes it easy for you to understand what part goes where. To keep costs down, we no longer powder coat this product. However, we do protect the product from rusting with a spray-on coat of semi-flat black paint. 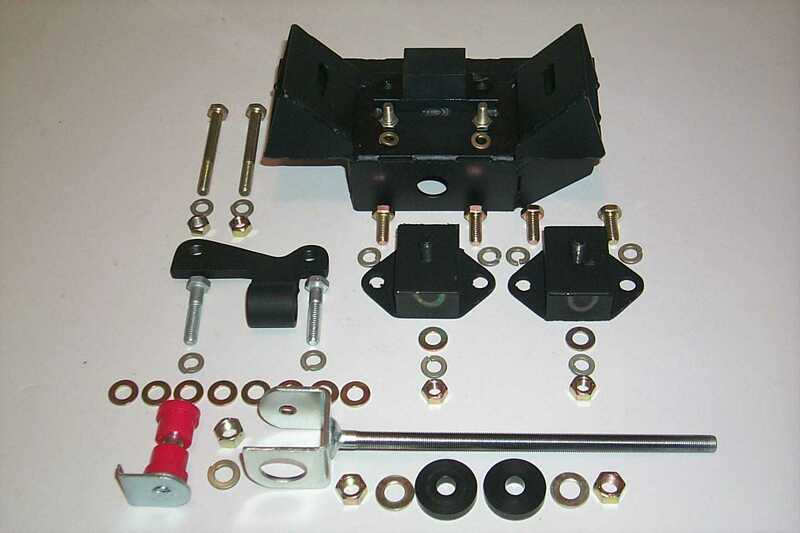 On the far left of the image you will notice a bracket (two mounting holes showing), this bracket attaches directly to the transmission tailshaft extension, or the overdrive adapter extension. Directly below this bracket are two longer mounting bolts (1.5") along with a series of 5/16" flat washers. Since, these extensions, as mentioned in the above paragraph, may have variations in their casting, it may be necessary to place 5/16" flat washer(s), as needed, between the bracket and the extension. Use the longer bolts if required. Moving on. In the lower half of the image you will notice the fully threaded stayrod. Since this rod is used for other applications, one must shorten the rod for one's particular need. When the transmission bracket and main bracket have been installed, simply measure the amount of thread to be removed. Finally, the large eye on the stayrod can be located on either side of the transmission bracket. However, the criteria being that the threaded rod's location, in relation to the hole on the main bracket, must be as central as possible.